Q1. What is Cloud Secure? Q2. Why do I need Cloud Secure? Cloud secure can prevent unauthorized users, insiders and hackers from stealing, modifying or deleting your important cloud files and folders. Yes, Cloud Secure is designed to lock your primary cloud folder, so files within subfolders (regardless of the file type) will be locked and password protected. Q4. What if I don't have any cloud accounts? Through Cloud Secure, you can setup a cloud account in just a few minutes. You can choose to setup all or just one cloud account on your PC, you have the option to choose from Google Drive, One Drive, Dropbox and Box. Q5. How do I know if my Cloud Secure password is strong? Cloud Secure has a built-in password meter which allows you to gauge the effectiveness of your password. The password meter is located under the Access Area menu. Q6. Can I view my Cloud files through Cloud Secure Interface? Yes, you can view your cloud folders and files through cloud secure interface, to do so, click on the 'View' button under the explore menu. Q7. Is there any limit of number of files or folders I can protect with Cloud Secure? Cloud secure simply password protects your primary cloud folder on Windows PC. Cloud Secure isn't concern with the number of files you have saved in your cloud account. The amount of files saved on your cloud account is contingent on cloud service subscription. Q8. If I forget my password, can I still unlock Cloud Secure? Yes, simply insert your serial key in the password field and press the 'OK' button. This will unlock cloud secure. However, make sure that you haven't disabled the 'Enable Master Key' option. Q9. How do I know if my cloud Account is locked through Cloud Secure? Within Cloud Secure main interface, you should be able to view the status of an individual cloud account. If your cloud account is locked, the lock button will be green. If it is unlocked, the button will be yellow. Q10. How do I change the password? To change the password, go into the 'settings' menu and under the change password menu, type in your current password, then enter your new password, once again confirm your new password and press the 'Apply' button. Q11. How to uninstall the program? You can uninstall Cloud Secure through your control panel menu. However, upon uninstalling, you will be required to enter your master password. Alternatively, you can disable the master password requirement by going into the settings menu and disabling the 'Uninstall Requires a Password' option. Q12. Is Cloud Secure free or Shareware? Cloud Secure is NOT freeware! It is shareware, which means you can try it before buying. We give you specific numbers of trial uses so that you can test the program and check whether it is useful for you or not. If you find it useful and want to keep it, register your copy and get a full version registration key via email in minutes. Q13. How can I use this program after the trial period? Under the main interface, you'll see a red button labeled 'Get Full Version'. 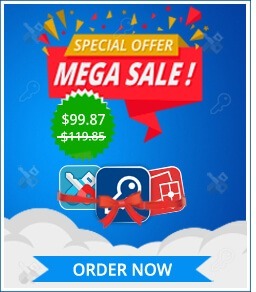 Click on that button which will direct you to purchase the software. Q14. Can I buy the program without first trying the evaluation version? Yes, you can buy the full version without evaluating the trial version. Q15. How can I suggest a new feature for the future releases? Q16. What are the benefits of registering? A registered version will allow you to use Cloud Secure without restriction and enjoy the software for the lifetime of your computer. Q17. Can I order online using my Credit Card or PayPal? Q18. Which Credit Cards do you accept? Q19. Is your order site secure? Is my Credit Card information safe on this site? Your payments, whether made through Credit Card, Cash or Check are handled by a trusted third-party e-commerce solution called BMTMicro.com or Regnow, Inc depending on where you purchase from. They have been selling shareware for over ten years and have taken orders of literally millions of customers worldwide. These companies obtain your Credit Card information on secure SSL (Secure Socket Layer) connection with a MSIE Lock or Netscape Blue Key icon on the status bar of the browser, which is designed to provide government level security for your credit card transactions. Which means no one can intercept your payment information while you are making an order. With today's encryption technology, sending your Credit Card number to a Secure Server over the Internet is as safe as using your credit card in a restaurant or retail shop (probably even safer!). Q20. I can't afford the program? Can I have a discount? Q21. Discounts for multiple licenses? Q22. How many licenses must a single-user buy for multiple computers? Q23. Can I buy an academic license? Or a site license? Q24. Why do I need to buy multiple licenses for multiple computers?